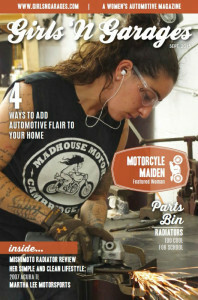 Looking for an automotive magazine written especially for women? That’s what Karen Vielkind set out to find in August 2014. After her search left her coming up empty handed, and her other lady gear head friends had no ideas either, Karen decided to take matters into her own hands, mixing her passion for cars, writing and creativity to form a new vision: Girls N Garages: a women’s automotive magazine. Girls N Garages started to take form in October of 2014. Karen, who works full time, poured all of her spare time into the creation of the magazine, which debuted its first issue in June 2015. The magazine features women in automotive, female project builds, technical how-to articles, and other professionals working in the industry. Right now, the magazine is a quarterly publication, the second issue came out September 2015, and the third is due in January 2016. Readers can subscribe to receive the digital edition or have the printed edition sent to them. Karen hopes that the Girls N Garages magazine and online community continue to grow, working its way towards making it a self-sustained monthly or bi-monthly publication. She has plans to partner with sponsors on magazine-hosted project builds and ultimately be able to provide scholarships for women seeking to enter the automotive industry.